Description: Instead of possible harmful drugs and antibiotics often prescribed by veterinarians, Young Living blends therapeutic-grade essential oils and wholesome herbs into a wonderfully soothing ointment that affords pets relief from minor skin irritations, cuts and abrasions. 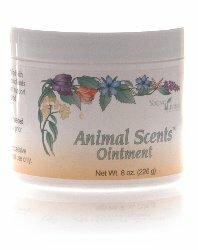 How to Use ANIMAL SCENTS - PET OINTMENT: Clean the affected area. Apply as needed. If using Young Living essential oils, apply oils prior to application of Animal Scents Ointment. Please note: The "Add to Cart" button is only for retail purchases. If you want to sign up as a preferred customer (autoship program) or as a distributor, you will need to enroll first and then add ANIMAL SCENTS - PET OINTMENT to your cart. Please see the How to Order page for more details.